I was in NYC this week and besides going to the Met, I stopped by the Lion Brand Yarn Studio (http://www.lionbrandyarnstudio.com/). It is a lovely place. I am thinking of doing a design with Wool Stainless Steel (75% Wool, 25% Stainless Steel) and I wanted to check out the colors. It is part of their LB Collection which uses premium fibers. You can only get it on-line or at the studio. Lion Brand and the Blumenthal family has been incredibly generous to TKGA and CGOA over the years. They provide items for the goody bags at the conferences. I can't recommend their acrylic yarns for use in the Basics course or the Masters program since wool is a better choice. Several craft store yarns work fine, however. Lion Brand Fisherman's Wool and Patons' Classic Wool are fine for swatches. I saw Don Giovanni at the Met. It is always nice to see the notorious womanizer dragged down to hell amidst 20 foot high flames. It was a quiet week. I only had a few lessons to review which worked out well since I was out of town. Susan from Hawaii finished Lesson 3. She just began in February. The length of time it takes to complete the course depends completely upon the student. Some take years; others take months. 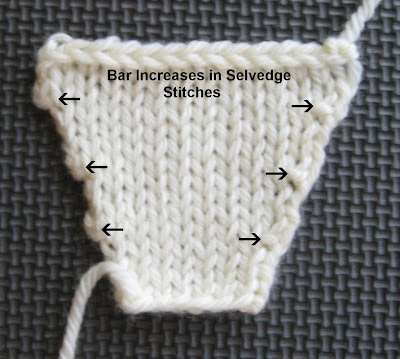 As promised, the tip for this week is about using Bar Increases in stockinette stitch. Generally speaking, when do you use increases? Most of the time you are increasing after ribbing for the body of a sweater or for sleeves. If you are knitting a top down sweater, you may use them to shape the neckline. Since Bar Increases are often the first increase knitters learn, it is important that you learn where to place it in stockinette. Since this increase produces a bar (purl bump) to the left of the stitch, it requires some thought. The eye expects symmetry. The sides should be mirror images. If the increases are not symmetrically placed, it can be distracting. 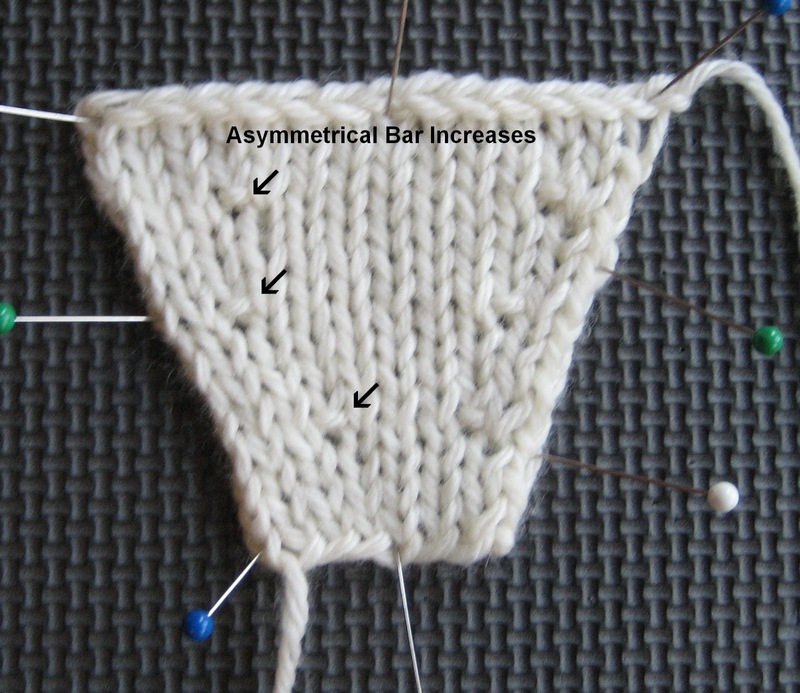 To symmetrically place bar increases, there should be the same number of stitches before the increases on the right and after the increases on the left. (Increases should not be worked in the selvedge stitches...more about that later). The right side is easy. 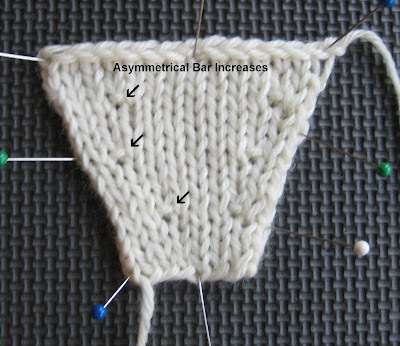 If you want two stitches before the increase, you work the bar increase in the second stitch. Remember, the bar will always be to the left of the knit stitch so it is a bit trickier on the left. If you make the increase in the second stitch from the end, the bar will be after the knit stitch so there will only be one complete stitch after the increase. 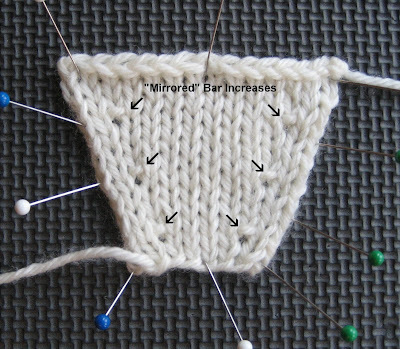 In the example above, the increase was worked in the third stitch from the end. The increases on the left are asymmetrical. Compare the left to the right. How important is this? Well, if you increasing for a sleeve, it doesn't matter as much. (Someone who looks at the seam and underarm of the sleeve and points out that the increases are asymmetrical really needs to get a life...except for Masters candidates.) If the increases are on a neckline, it is important or the neckline will look sloppy. M1 or Lifted increases are a better choice for increases in stockinette as they blend in with the fabric. If you want the increases to be decorative, they will definitely stand out. Unless a pattern specifies it, NEVER EVER place increases in the first and last stitches. Since most patterns don't tell you where to place the increases, this is a very common mistake. First, it is ugly. Second, it makes finishing much more difficult. For any project which will be seamed or have stitches picked up along the edge, it is important that there is a seam allowance of one stitch. Be sure to keep at least one stitch at the selvedge. Compare this photo to the first one and consider where you would place a seam. Seaming the top swatch would be much easier. Salon this week will be on Saturday. The SEC basketball tournament is going on but I don't think UK plays during the day. I know they play today. This is a fun (or terrible) time to be in Lexington depending on how the team is doing. People around here could use some cheering up. Last week we had tornadoes, 5 inches of snow, and flash floods. Thanks to all who asked about the tornadoes. Lexington was spared although I did have to round up the cats and spend some time in the basement when the sirens went off. Two days later I was shoveling snow! You rarely see George and Petipa in the same location. George is very territorial and Petipa just thinks George is a jerk. I don't know what was going on this day. Maybe they were too tired to move. I'm glad I had my camera. I didn't knit much this week since I was out of town. I did manage to finish the wave socks except for weaving in the ends. They are blocking right now. I am not looking forward to weaving in the yarn tails! I reversed out the colors for the socks but you don't really notice it unless you look at the toe, heel or cuffs. On the plane I started my FINAL birthday present. I really have to finish them up and get started on the sweater for Cast On. Cynthia wanted pink, loose socks. This pattern is very stretchy and should work fine. It is the same stitch pattern I used for Harriet's socks. The yarn is Solemate and the color is Lincoln Park Zoo.